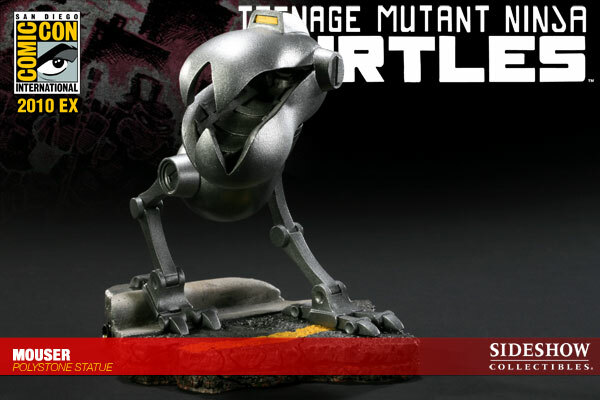 With the release of their weekly newsletter tonight, Sideshow has revealed a (slightly) better picture of their upcoming 2010 San Diego Comic-Con exclusive Mouser comiquette, as well as the pre-order dates you need to know if you want to get one of these. The pre-order for Comic-Con attendees will be at 10:00am pacific time on June 10. The pre-order for Comic-Con non-attendees will be at 10:00am pacific time on June 11. IMPORTANT! If you are not going to Comic-Con, there is no way to fudge the system and pre-order as an attendee and still get the Mouser. You will need to pre-order on June 11. I highly recommend that whichever pre-order event you participate in, you BE PUNCTUAL. This is likely to sell out quickly. If you are attending Comic-Con but miss the June 10 pre-order event, you could still pre-order as a non-attendee on the 11th. However, you will have to pay a slightly higher price + shipping. There is no way to fudge the system and pick up the item at the Con if you do not pre-order it as an attendee. I'll put up a reminder the week of the pre-order events - Good luck! Mirage is at it again! This week they're auctioning the original artwork used to create the Jake Black cancer benefit t-shirt and art print as an additional fundraiser for Jake! Awesomesauce! You can click each piece of art below to go to the respective auction. Bid high and bid often! 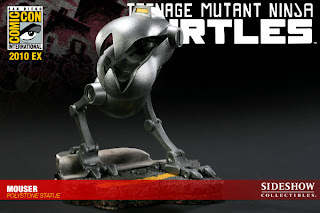 Today, Sideshow Collectibles revealed the first glimpse of the exclusive items they will be offering as part of this year's San Diego Comic-Con event in July, and a TMNT Mouser comiquette is one of the four items!! We'll have to wait until April 15th for further details, but it is very exciting for Sideshow to be making their TMNT line part of their Comic-Con event! 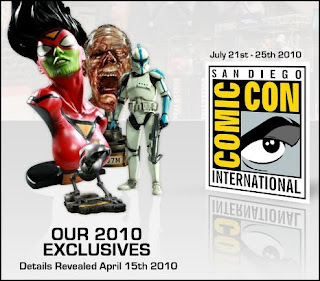 For those not familiar with Sideshow's convention exclusives and not fortunate enough to attend Comic-Con this year, fear not, you're not out of luck! Sideshow always makes a small percentage of each exclusive available to non-attendees. But you will have to pay VERY close attention to the forth-coming details, as there can't be any slacking if you want to snag one. Attendees should also be prepared and alert to pre-ordering details, as all of these will be sold out before the convention starts. Stay tuned to SideshowToy.com or Ninja Pizza to get the details as they're made available! 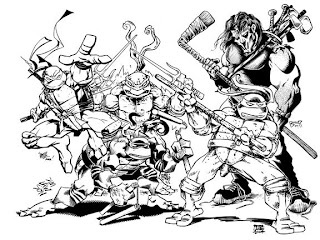 You may recall that during last summer's convention season, Mirage Studios created two special TMNT art prints that they then sold to raise money to help Tales of the TMNT writer Jake Black pay some of the medical bills he accrued during his recent battle with Hodgkin's Lymphoma. The good news is that Jake is currently in remission and with luck his active battle against the cancer is over. However, those pesky medical bills still linger. Mirage has found a handful of the remaining prints and they've put them up on eBay, with all money raised still going to Jake! This first one is a "jam" piece featuring art by all of the artists who were still at the studio last year (2009). 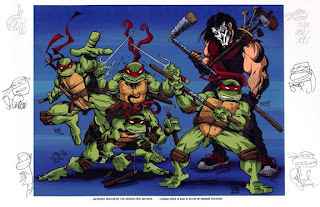 The second print is quite monumental, as it features pencils by Kevin Eastman and inks by Peter Laird. 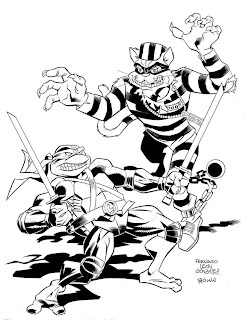 This piece of art was the first piece the two TMNT creators collaborated on in over 18 years, and is most likely the last piece of art they will ever collaborate on. 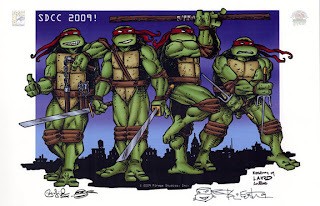 If you weren't able to grab these last year, here's a great chance to pick up these incredible pieces of TMNT history while contributing to a great cause! You can click either picture to be taken directly to the respective eBay auction. As a side note, I got to spend a little time with Jake this past weekend at WonderCon in San Francisco. He's looking great, and I hope things continue to go great for him!